J.D. 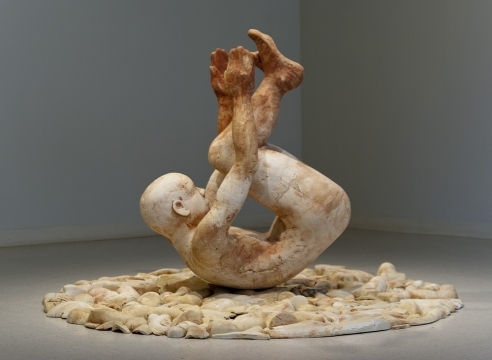 Perkin creates figurative ceramic sculpture, inspired by the human form. The surfaces are rich and organic, with agitated, colored and etched surfaces. This series of both life-sized and small ceramic pieces, consists of solitary figures as well as pairs or groups. They are captures in moments of repose, or energetic actions like boxing or kicking. Some are contorted to the point of abstraction, others hint at eroticism. Perkin’s use of color and pattern heightens the sculptures' physical and emotional charge. He is intrigued particularly with surface patterns created from a variety of glazes and oxides. These patterns accentuate the forms while, at the same time, constraining the figures. Seen in person, Perkin’s sculptures are thoughtful and inquisitive expressions alluding to a narrative with a mesmerizing aesthetic. A Portland native, J.D. Perkin has exhibited his work since 1982. He received a BS from Portland State University in 1984, with a focus on anthropology. While there, he also received an Award of Excellence in Painting from the School of Fine and Performing Arts. A large part of Perkin’s artistic development includes performance art. He received a grant from the Metropolitan Arts Commission (RACC) in 1990 for his performance piece “Dirt Box.” In 2007, Perkin collaborated with Anne Thompson on Second Skin, a sculptural installation for the Portland Art Center. His work has been featured at the Portland International Airport, the Bush Barn in Salem, and on Oregon ArtBeat.